Disclosure: I received a free bottle of product in return for my honest review. Luxating Patella is a common condition in Yorkshire Terriers. Luxating Patella is when the knee cap pops out of place due to a misalignment of the knee. Find out more about this condition at http://www.2ndchance.info/patella.htm. This can be an inherited condition or happen as a result of an injury. Two of my Yorkies were born with this condition. Patellar luxation is often divided into four grades of seriousness. Artie and Coby currently have low grade issues. To help prevent the condition from getting worse, all three dogs are taking Glucosamine which is a joint supplement. They have been taking it for just over a year as prescribed by our veterinarian. They were taking the supplement in soft chew form, which they love. I was given the opportunity to try K9 Joint Relief which is Veterinarian Recommended, superior quality, all natural hip and joint supplement. It’s manufactured in the U.S. in a state-of-the-art FDA approved facility under strict quality assurance guidelines. What I didn’t realize is that this supplement comes in liquid form. It comes in a one quart bottle with directions for use based on the weight of your dog. For all dogs, you can start them on their dose, then reduce to a maintenance dose (1/2 the amount) after 6-8 weeks. Because my dogs have been taking Glucosamine for some time, I decided to start them on the maintenance dose. They get 1/2 teaspoon one time each day. I use a dropper to add the liquid supplement directly to their food in the evening. They don’t seem to recognize that the supplement has been added. They gobble down their food just as normal. The only issue is they expect a treat after eating as they were use to having their Glucosamine soft treat. So, I give them another form of treat. 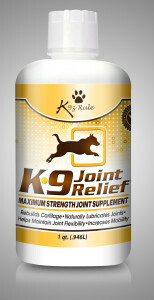 K9 Joint Relief does not have to be refrigerated. It can be mixed with food or water. I personally find the soft chew formula that I was using easier to manage. Right now, the K9 Joint Relief bottle is new and filled to the top, so I am able to squeeze a small amount into the dropper by placing it just inside the bottle. But as the liquid decreases inside the bottle, the dropper will become more difficult to fill. I may then need to start pouring the liquid into a 1/2 teaspoon (for each dog). I haven’t tried this yet, so I’m not sure how difficult it will be to pour three 1/2 teaspoons. As I said, I prefer the soft chew formula when it comes to giving the supplement to the dogs. Only time will tell if the K9 Joint Supplement or any other Glucosamine supplement will have a positive effect on the dog’s joints. My hope is that this supplement will allow them to lead a normal happy pain-free life without the need for surgery.